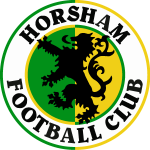 One of the best crowds of the season saw Horsham hammered by the promotion favourites but it was the homesters who started off more briskly. 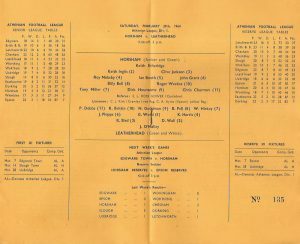 Billy Bell put Tony Miller away and the winger beat one defender before slipping the ball to Richard Hounsome who failed to get it under control. However Bell, following up, crashed in a powerful drive that flashed just wide. 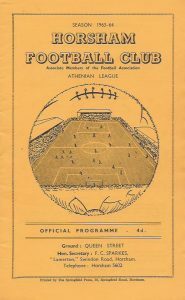 But the Tanners pulled ahead when Keith Etheridge hesitated as the ball bounced dangerously in the goalmouth and Brittin hooked the ball into the net. Five minutes later, Horsham failed to completely clear a Leatherhead corner and the ball fell to Harris who lobbed it home after his initial shot had been blocked. The visitors came close when Pell put Brittin away down the centre but, with only Etheridge to beat, he drove wide from just five yards. However, there was no mistake when Hickey crossed for Dobbs to crash a header in for number three. Back came Horsham and, after a great right-wing dash by Bell, the ball was quickly taken off Hounsome’s head by the quick-witted O’Malley before Miller went close from a narrow angle. The Surrey side missed a wonderful chance when Bell broke clear of the defence. He passed when he should have shot and Hickey hit wide. 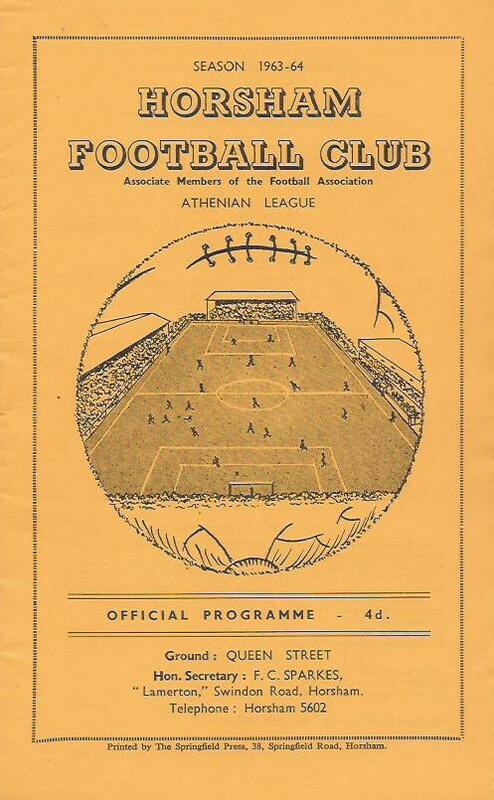 After Ken Awcock’s shot had been saved on the line, the ball hit a Horsham goalpost and was tipped over the bar by Etheridge. Any hopes Horsham had of capitalising on the slope in the second half were quickly dashed as their opponents scored twice in four minutes. 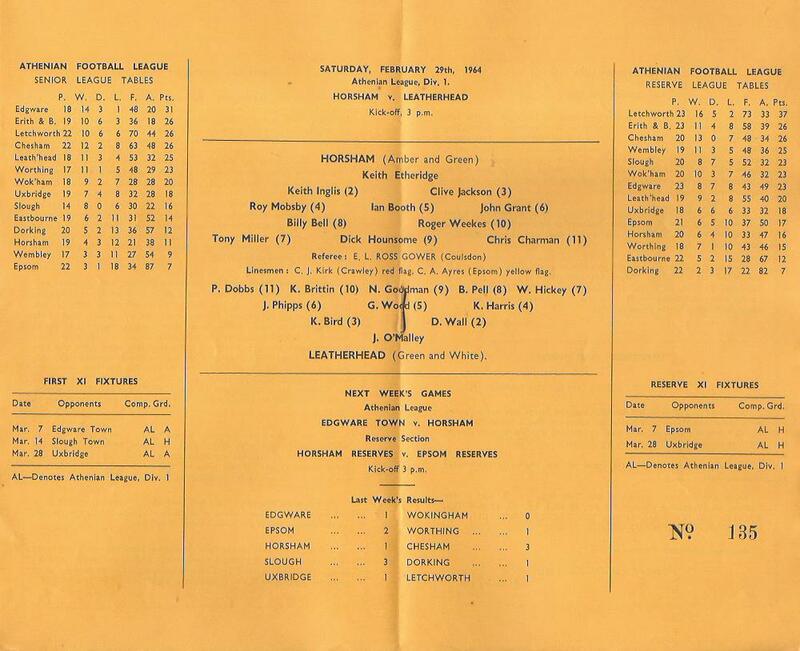 The first came after Awcock miskicked to Dobbs who put the ball straight back to centre-forward Goodman to net. He repeated the feat two minutes later and, but for acrobatic saves from Etheridge, the Tanners would have added another couple in quick time. O’Malley then had to make a great save as right-back Wall failed to cut out a long cross from Awcock and Miller fired in a fierce shot. But Leatherhead came again and Dobbs cleverly flighted a high ball past Etheridge following a corner by Pell.